collections for the County wide “Christmas to Remember” drive. 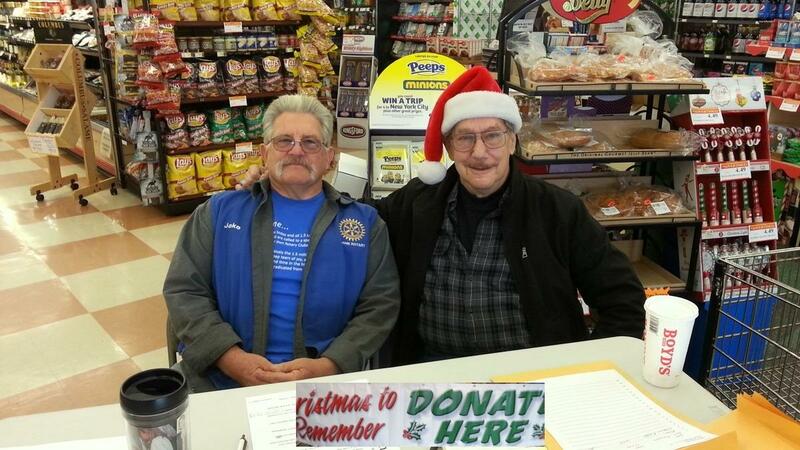 Ione Rotary has manned collecting community donations for Christmas to Remember for at least the last fifteen years. This year the citizens of Ione and the West County contributed $7,000 of the $40,000 collected over two days. Ione Rotarian Doug Knutsen provides space at the Ione Plaza Market for us to take contribution inside and out of the weather. All of the funds raised provide needy County children with new clothes for Christmas. Each child selected receives a list of items to acquire and a voucher then they make their own choice as to color and style; supervised by a seniors and older students. Jackson’s local Kmart has been very gracious in supporting this program providing the students with 50% off of the items they chose.